But if there was one sin above another which called for the destruction of the race by the flood, it was the base crime of amalgamation of man and beast which defaced the image of God, and caused confusion everywhere.—Spiritual Gifts, vol. 3, p. 64. Every species of animal which God had created were preserved in the ark. The confused species which God did not create, which were the result of amalgamation, were destroyed by the flood. Since the flood there has been amalgamation of man and beast, as may be seen in the almost endless varieties of species of animals, and in certain races of men.—Ibid., p. 75. 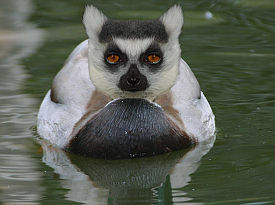 A cross between a mallard and a lemur, created by a photo editing program. What she describes here would have to be something akin to genetic engineering for the simple reason that "amalgamation" through natural means is impossible, except in animals that are very similar, like horses and donkeys. Why "amalgamation" is impossible through natural means is this: Every egg has two outer membranes, the zona pellucida and the vitelline membrane. These membranes form a barrier that prevents cross-species fertilization. If scientists remove the zona pellucida, they can produce some cross-species fertilization, as in humans and hamsters. In fact, such a procedure is routinely used in order to test male fertility in humans. The zona pellucida of hamster eggs is removed, and then the percentage of eggs fertilized by human spermatazoa is determined. If that percentage is below a certain level, then a diagnosis of infertility is reached. Yet the removal of the zona pellucida only facilitates cross-species fertilization to a point. Scientific experiments have demonstrated that even then, the vitelline membrane still prevents the crossing of certain species, such as the fertilization of mouse or rat eggs by human spermatazoa, and the fertilization of rat, mouse, or rabbit eggs by guinea-pig spermatozoa (J Exp Zool. 1979 Dec; 210(3):497-505; 1978 Feb; 203(2):277-85). In the antediluvian world there were many wonderful works of art and science. Fresh from the hand of the Creator, these descendants of Adam possessed capabilities that we do not now see.—Signs of the Times Feb. 1, 1899. Notwithstanding the wickedness of the antediluvian world, that age was not, as has often been supposed, an era of ignorance and barbarism. . . . They possessed great physical and mental strength, and their advantages for acquiring both religious and scientific knowledge were unrivaled. . . . Their mental powers were early developed. . . . Could illustrious scholars of our time be placed in contrast with men of the same age who lived before the Flood, they would appear as greatly inferior in mental as in physical strength. As the years of man have decreased, and his physical strength has diminished, so his mental capacities have lessened. There are men who now apply themselves to study during a period of from twenty to fifty years, and the world is filled with admiration of their attainments. But how limited are these acquirements in comparison with those of men whose mental and physical powers were developing for centuries!—Patriarchs and Prophets, pp. 82, 83. The evolutionist who believes that man is gradually becoming more and more advanced might scoff at the above, but we should remember that Ellen G. White did not believe in evolution. She was a biblicist, and as such believed that the human race is "devolving" rather than evolving. For that reason, she believed that man is getting dumber and dumber, not smarter and smarter. In the parable of the sower the question was asked the master, "Didst not thou sow good seed in thy field? from whence then hath it tares?" The master answered, "An enemy hath done this" (Matt. 13:27, 28). All tares are sown by the evil one. Every noxious herb is of his sowing, and by his ingenious methods of amalgamation he has corrupted the earth with tares.—Selected Messages, bk. 2, p. 288. Ellen G. White's writings are by no means the only source that suggests that some sort of genetic engineering and mixing of species took place in the distant past. Egyptian, Assyrian, Greek, and Roman myths and architecture abound with creatures that are a cross between humans and horses, goats, fish, snakes, bulls, lions, and hawks. All these amalgamated creatures are evidence of either overactive imaginations, or genetic engineering conducted by ancient peoples. The Book of Enoch speaks of ravenous, man-eating giants that resulted from the pre-Flood crossing of fallen angels and people (chs. 6, 7, 85-89). Maybe this idea was inspired by a mistaken interpretation of Genesis 6:2-4. Or perhaps the Book of Enoch contains a garbled account of how fallen angels worked with human beings to genetically engineer such strange and ravenous creatures as Tyrannosaurus rex. There are a lot of people today that are skittish about genetic engineering. They worry about the potential hazards if something goes awry, for example. Now if it be true that Ellen White wrote about genetic engineering more than a century before it was scientifically possible, and if God got upset at the antediluvian race for tinkering with the genetic code, then there may be more hazards to genetic engineering than what most people think. We should also consider the possibility that Ellen White was describing other technologies as well, such as the adding of cells of one species to the embryos of another species. What this procedure does is produce composite creatures called chimeras that have parts of both species. Chinese scientists at the Shanghai Second Medical University in 2003 successfully fused human cells with rabbit eggs. The embryos were reportedly the first human-animal chimeras successfully created. . . . In Minnesota last year researchers at the Mayo Clinic created pigs with human blood flowing through their bodies. . . .
What's caused the uproar is the mixing of human stem cells with embryonic animals to create new species. . . .
Weissman has already created mice with brains that are about one percent human. Later this year he may conduct another experiment where the mice have 100 percent human brains. This would be done, he said, by injecting human neurons into the brains of embryonic mice.—"Animal-Human Hybrids Spark Controversy." Weird, huh? You'd think the world was coming to an end. . . . Well, maybe it is. What do you think of Ellen White's amalgamation comments? They shouldn't be putting flounder genes in tomatoes. They're just asking for trouble. Maybe she was describing genetic engineering in her 1864 and 1899 statements. Who knows? She was daydreaming, and nothing more. The idea of ancient, highly advanced civilizations is against my religion, since I believe in evolution.